Natures Purest use only the finest organic cream cotton buds which are hand picked and luxuriously soft. This sensitive material will look after your baby's delicate skin. This bathrobe and slipper set is perfect for your baby to wear after bath time or swimming. The bathrobe features an embroidered sheep face on the hood with 3d ears and the slippers have an embroidered sheep face on each slipper. 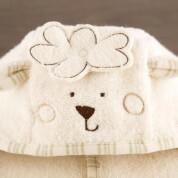 It is made up of 100% cotton towelling so is super soft to touch. This luxury baby gift is gift boxed in brown recycled card box with an acetate lid and signature hand tied ribbon. It also includes a cardboard gift tag which you can write the recipients name on and a love from message. Available in 1 size: 0-6 Months. 40 degree wash is advised.